PROVIDENCIALES, TCI -- Turks and Caicos Islands (TCI) Governor Peter Beckingham welcomed leaders from seven of the UK’s Overseas Territories for lunch at his official residence on Thursday. “I was delighted and honoured to have the opportunity to welcome to the Turks and Caicos Islands on 20 and 21 July the premiers, chief ministers and ministers from no less than seven Overseas Territories: Anguilla, Bermuda, BVI, Cayman Islands, Falkland Islands, Gibraltar and Montserrat. This is also a big honour for TCI, and a tribute to the work of many people here. 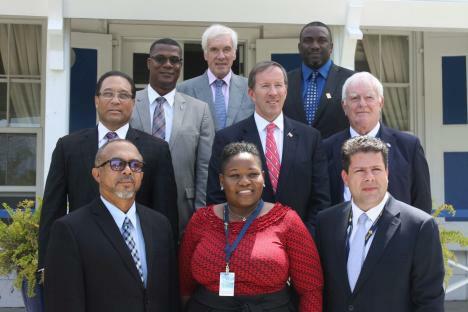 The territory leaders were in TCI to prepare for their annual meeting with the FCO’s minister for the overseas territories and her ministerial colleagues at the Joint Ministerial Council which will be held in London in October,” Beckingham said. On the first day of the meeting, a letter was delivered to TCI Premier Dr Rufus Ewing from the new minister for the overseas territories at the Foreign and Commonwealth Office (FCO), Baroness Anelay. In addition to her existing responsibilities as minister of state for relations with a range of international organisations, the minister has taken on this additional role for working with the territories and will chair the Joint Ministerial Council meeting in London. Beckingham noted that he was able to talk informally with the territory leaders about the wider changes which have taken place in the UK recently. The biggest development has been the vote in the referendum in favour of leaving the European Union, closely followed by the appointment of a new prime minister, Theresa May. “The prime minister has in turn made a number of major changes to our Cabinet, including a new foreign secretary (who I had the privilege of working with in India on two visits he made as mayor of London) and chancellor of the exchequer,” he said. According to Beckingham, it is too early to predict what these changes signify for the overseas territories, but Baroness Anelay has underlined the continued commitment of the UK government to the overseas territories, as well as to involve them in the preparations for negotiations for the UK to leave the EU. “I was in London in July to attend meetings with other governors and ambassadors in the Foreign Office shortly after the referendum. It is clearly going to be a major task for UK ministers and officials to prepare the groundwork for the UK’s exit from the EU. They were also equally clear that the territories … will continue to be a part of the new structures of trade and services which emerge from international negotiations,” he said. Beckingham also noted that the recent big changes in Britain’s governing Conservative Party also demonstrated how efficiently and smoothly the democratic systems of government work in the UK, with one prime minister departing and another taking over in the space of less than 24 hours. “It was, on any reckoning, an extraordinarily dramatic day in British politics, but accomplished in style and dignity,” he said.